Felice Squassoni off duty in his ANR uniform. Photo kindly via Ferdinando D'Amico. Felice Squassoni was born on 3 November 1915. Squassoni served in the 365a Squadriglia, 150o Gruppo C.T. This unit was equipped with Fiat CR.42s. When the war started on 10 June 1940 3o Stormo was sent to the French border to take part in the attacks on southern France. The formation from the 150o Gruppo departed from Villanova D’Albenga (in Liguria near the sea) at 12:00 and was composed of 27 Fiat CR.42s divided in three groups. Their target was the airfield of Cuers Pierrefeu and they arrived there at 13:00. A first group of eight aircraft commanded by Capitano Giorgio Graffer (CO of the 365a Squadriglia) and composed of Tenente Franco Gatti, Sottotenente Lorenzo Clerici, Maresciallo Felice Sozzi, Maresciallo Virginio Bodini, Sergente Maggiore Guido Fibbia, Sergente Maggiore Squassoni and Sergente Bruno Zotti (all from the 365a Squadriglia) attacked the airfield of Cuers itself. A second group of nine fighters from the 363a Squadriglia led by the Gruppo CO Tenente Colonnello Rolando Pratelli (Capitano Luigi Mariotti (Squadriglia CO), Tenente Pietro Garfagnoli, Sottotenente Mario Daverio, Maresciallo Giuseppe Salvadori, Sergente Maggiore Natale Viola, Sergente Maggiore Bruno Benassi, Sergente Paolo Rossi, Sergente Antonio Lazzari) and a third group of eight aircraft from the 364a Squadriglia under command of the 53o Stormo commander Colonnello Arrigo Tessari (Capitano Nicola Magaldi (Squadriglia CO), Capitano Nino Caselli, Tenente Giuseppe Enrico Zuffi, Tenente Alberto Spigaglia, Maresciallo Delfino Fratini, Maresciallo Ugo Guidi, Sergente Maggiore Virgilio Pongiluppi, Sergente Giovanni Negri and Sergente Achille Pacini) covered Graffer and his men during the strafing attack. Squassoni was then posted to the 85a Squadriglia, 18o Gruppo, 3o Stormo. This unit was also equipped with Fiat CR.42s. Squassoni was with the unit during its operations in the Battle of Britain as a part of C.A.I. when 18o Gruppo was temporarily assigned to the 56o Stormo. They were based at the Saturn base (Ursel). In January the unit was re-located to Libya. On 10 May 1941, Blenheim IV T2274 of 14 Squadron (a unit which had just arrived to North Africa from Sudan) took off at 14:40 to bomb Derna satellite airfield. It was intercepted near Sollum by Sergente Maggiore Squassoni of 85a Squadriglia. Squassoni attacked for more than a half hour, seeing hits, but was only able to claim a probable. However, the bomber had suffered fatal damage, one propeller flew off and the other engine cut and it subsequently crash-landed east of Sollum, although Sergeant John Robert Taylor and his crew (Sergeant John Arnold Ashley Parker and Flight Sergeant Ronald Frank Hall) survived unhurt. The relief for Taylor and his crew was short however and they were killed eleven days later when the squadron lost five aircraft. On 12 July Sergente Maggiore Squassoni claimed a victory over Benghazi, Cirenaica. 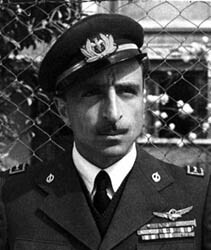 After the Italian capitulation in 1943 he served in the Italiana Aeronautica Nazionale Repubblicana (ANR) where he served in the 1a Squadriglia of 2o Gruppo C.T. of the ANR. At 15:00 on 26 December 1944 ten Bf 109s of 1a and 3a Squadriglias scrambled from Aviano to attack eight approaching Mustang IV fighter-bombers from 3 RAAF Squadron. After the attack the Italian aircraft became split up and when Sottotenente Squassoni approach back to his base he was attacked by the RAAF Mustangs who had been waiting for the returning Italian aircraft over their base. He was attacked by Squadron Leader Murray Nash and his wingman Flying Officer Andrews, who chased him across the airfield’s southern boundary at zero feet. They were able to overtake Squassoni’s Bf 109G-14 easily but being so close to the ground Nash had difficulty in keeping a bead. Closing to 100 yards he fired three long bursts and the Messerschmitt started to stream glycol. Nash broke away upwards expecting Squassoni to crash, but the Italian fighter remained airborne. Flying Officers Andrews and the Thomas joined in, and the former closed to 150 yards, firing until forced to pull away at 20 yards. He saw strikes on the port wing and cockpit, and by this time the wheels were hanging down. Notwithstanding this, the Messerschmitt of the terrified, helpless, Squassoni kept flying as he tried to lead his pursuers over Aviano’s (as yet inexplicably silent) flak defence. He realised he could no longer withstand the attacks and, as Thomas’s Mustang came in firing three more bursts, he saw a flat vineyard and pushed the stick hard, crashing his ‘Black 8’ at full speed. The aircraft continued for hundreds of feet, uprooting vines, stakes and small plants before coming to rest. Squassoni jumped from the cockpit and ran, fearing both strafing and the explosion of his aircraft, but nothing happened. The sudden crash-landing led Thomas to lose sight of the Bf 109 and it was thus claimed only as damaged, shared between the three Australians. In February 1945 the 1a Squadriglia of 2o Gruppo C.T. was renamed to the 4a Squadriglia of 2o Gruppo C.T. in an effort to conform to the Luftwaffe system. At 10:30 on 3 March 1945 twenty-two Bf 109s of 2o Gruppo scrambled from Aviano and Osoppo to intercept Marauders from 12, 24 and 30 SAAF Squadrons, who were attacking the Conegliano marshalling yards. The Italian fighters intercepted at 10.41 near Pordenone. The combat was confusing and over the Adriatic Sea a section of aircraft led by Capitano Ugo Drago (Bf 109G-10/AS/U4, Werk. Nr. 491353, ‘Black 7’) took on a group of six bombers. Sottotenente Squassoni (‘Black 13’) and Tenente Valenzano (Bf 109G-10/AS, Werk. Nr. 491323, ‘Black 3’) each claimed a Marauder. By 10.56 the Italians had been outdistanced over the sea and were back on the ground a quarter of an hour later. The claims in this combat are very confusing. The Italians claimed 6 Marauders and 1 Spitfire. No Marauders were in fact lost (two were damaged) and the only loss for SAAF was Lieutenant Reim of the escorting 4 SAAF Squadron Spitfires, who were shot down. The SAAF pilots claimed 1 probable Bf 109 and four damaged (two of the identified as Fw190s). The Italians lost two Bf 109 (of which one was shot down a low altitude by German Panzers tragically killing the pilot) and got two damaged. On the afternoon on 2 April 1945 American B-25s attacked the Brenner Pass at Ora. 25 Bf 109s of 2o Gruppo intercepted this attack but it was to cost them dearly. In the combat the Italians lost 14 Bf 109s (shot down or damaged beyond repair) with six pilots killed, two wounded and five parachuted. The Italians claimed three to five victories but in fact no American aircraft were lost. Squassoni ended the war with 1 biplane victory and a total of 2. Squassoni passed away in Brescia on 29 July 2008. Biplane victories: 1 and 4 shared destroyed, 1 probably destroyed. TOTAL: 2 and 4 shared destroyed, 1 probably destroyed. (b) Blenheim IV T2274 of 14 Squadron shot down; the crew was safe. (c) No Marauders were lost in this combat. La caccia notturna Italiana 1940-1942 - Giancarlo Garello, 1996 Aerofan nr. 57 apr-giu 1996, kindly provided by Jean Michel Cala. Additional information kindly provided by Ferdinando D’Amico, James Oglethorpe, Ludovico Slongo and Gianmaria Spagnoletti.